Scouts are the main stream section of our Scout Group ~ the Scout Troop, these are boys and girls usually aged between 10.5/11 to 15 years of age. Scouts within the Scout Troop are placed into a Patrol and wear shoulder flashes of the colour of their Patrol named after animals or birds; a Patrol comprises usually six Scouts, the senior one of these being the Patrol Leader wears two white strips down there Scout shirt pocket, and a Patrol Seconder who wears a single white strip down there Scout shirt pocket. The Patrol Leader and Patrol Seconder supervise and manage their Patrol and help the other Scouts within the Patrol with discipline, inspections, Scout test work and in games to encourage a friendly and proficient team skilled in all aspects of Scouting, particularly camping. 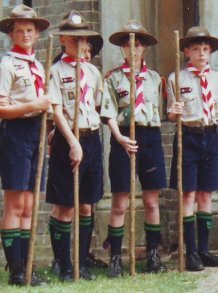 There is also a Troop Leader who is a Scout with great experience of Scouting, who wears three white strips down their Scout shirt pocket, the Troop Leader leads any ceremonies and supervision of the Scout Troop along with the Leaders. 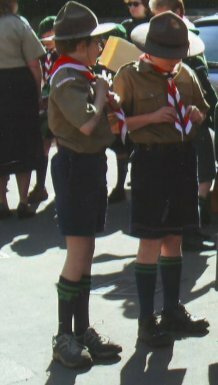 Scouts are easily recognised by their distinctive and very smart traditional Scout uniform, comprising a khaki short sleeved shirt, a traditional Scout hat, navy blue cord shorts, a traditional Scout leather belt, navy blue long socks with two emerald green rings around the sock downturns supported by emerald green garter flashes. They also wear their Scout Group colour neckerchief with a woggle often made by themselves. The uniform is purchased from the Scout Group who maintains a good stock of all Sections’ uniforms. Scouts meet usually once a week. They are required to attend Church Parades held once a month, attend Troop and Patrol camps and support the Scout Troop and Scout Group in various other activities from time to time of which they will be notified. And most important uphold at all times their SCOUT PROMISE that they solemnly make at their Investiture along with their SCOUT LAW. Scouts enjoy making new friends from the catchment area of the scout group not just school friends. 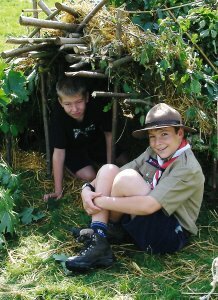 Scouts are encouraged to take part in a wide range of traditional scouting activities and challenges, mostly outdoors, as part of the scout training programme. ‘participation’ is the key approach for scouts and for their advancement as proficient scouts and good citizens. Passing scout tests and gaining many badges in varied subjects, camping, survival, cooking, cycling, hiking and other general adventurous activities, team working, playing games, learning good sportsmanship, learning the importance of keeping fit and developing skills and creative talents, helping others, all within our very friendly family orientated scout group. SCOUTING is about being with friends, as part of a team, participating fully in the adventures and opportunities offered. Hopefully all Scouts will gain their top award ‘THE SCOUT CORD’ before their 15th. 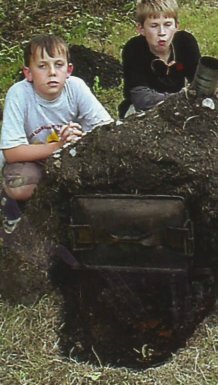 Birthday so that they are ready to progress and become a Senior Scout in our Scout Troop at the age of 15 years old.